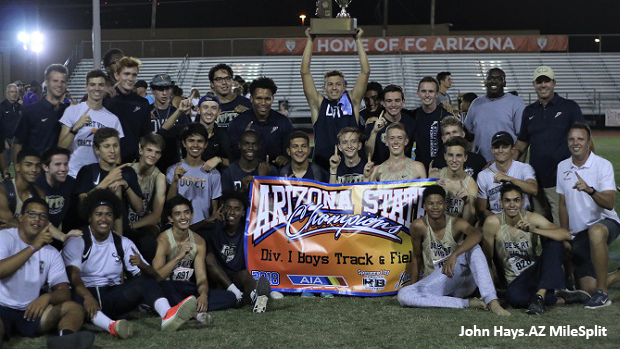 Though they didn't claim many individual titles, the boys of Thunder overtook the Chandler Wolves at last year's AIA State Championships by over forty points. 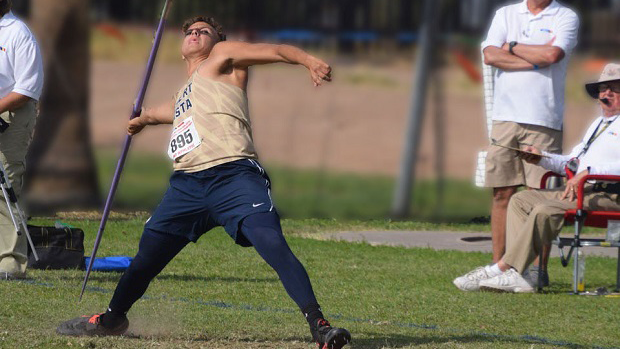 The bulk of their points came from the throws squad with Deshon Toney (2018) clinching victories in the rotational throws and Kevin Fairchild (then Junior now Senior) taking the victory in the Boys' Javelin. Meanwhile, the distance squad returns with Lee Nasewytewa who broke 3-mile and 5km school records in cross-country and Sammy Van Alstine (Jr.) who clinched the Division 1 Cross Country State Title, last November. Can the Thunder pull off the upset again this May? Who are your top returners? Obviously, on the distance side we'll have Lee Nasewytewa, Sammy Van Alstine, and Travis Kearney returning. Travis has very natural speed and I think track is a little more his forte. He ran 4:26 for 1600m as a sophomore and I suspect he'll do very well in the mile and two-mile this year. If there's a part of our program that reloads even better than distance it's the throws. Coach Hickel and Coach Rudolph are doing amazing job with the throwers and we ended up pulling 53 points from the boys last year. We return Kevin Fairchild, the 2018 State Champion in the D1 Boys' Javelin. Jason Fritz (Sr.) could also step up for our varsity and Mason Hickel (So.) will likely develop as a competitor as well. I expect Ethan Wright to improve from last year. He set a school record in the 300m Hurdles and I expect him to be even better in the High Hurdles. He's focused and he's been working hard and I expect him to build upon that. Gabe Deutsch is also a top returner for the 400-meter dash. He was injured during the winter but he is coming back, slowly but surely. Do you have any impact freshman or incoming transfers? I certainly think our freshman stand out as a class. For example, Ethan Burkowski had an incredible winter; Noah Jodon just got cleared to train again after taking care of some pain he had in his leg; Nolan Billeter just came out to run again after having made varsity soccer as a 6' 2" freshman. They've got a ways to go before they get around to scoring in a varsity invitational or running a qualifying time. Having only worked with Josh Lowry for six or seven months, we've had to find a balance because we had to go by his experience and what he was telling us. From what we got out of him in cross-country, I think we're just starting to scratch the surface. What meets are you keying in on this year? Aztec will be our opener. Obviously, Chandler Rotary is an important meet and then Arcadia two weeks later. Based on who we qualify and in what events we'll determine who gets to race what at certain events. Even though we can only take four to the State Meet we try to give everybody opportunities to qualify. How has your preseason training been going? 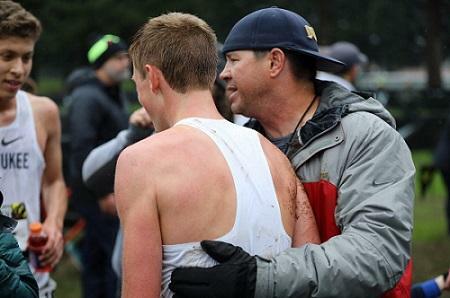 We had a strong winter for the distance kids and a handful of sprinters that were out. Some throwers got about a month of preseason training. In typical Desert Vista fashion, we recognize that it doesn't happen between February and May. I respectfully rebuke the notion that we're a high mileage program but a big part of our belief is that volume is a variable that if applied correctly will help you become fitter. It's a progression and the idea is for our athletes to go on to compete at the college level without tapping out. When we're talking volume, we mean the whole pie and that doesn't mean that we just grind a hundred miles a week. At this point we're running faster right now than we would during June and July because our bodies aren't having to cool us down like they would need to during the summer. I think the temperatures here during November, December, January are a huge advantage for Arizona athletes. How would you describe this year's team? I think it's hopefully a recurrence of teams of the past having points come in from all different directions. We've always tried to be the best we could be in every event and not be known as a distance only school or a throwers' only school. Have you set any goals as a team? We focus on the day to day process of trying to be the best that we can be. We want to stay in the process and to continually do the best we can at any given moment. I know that sounds cliché but it's the truth.